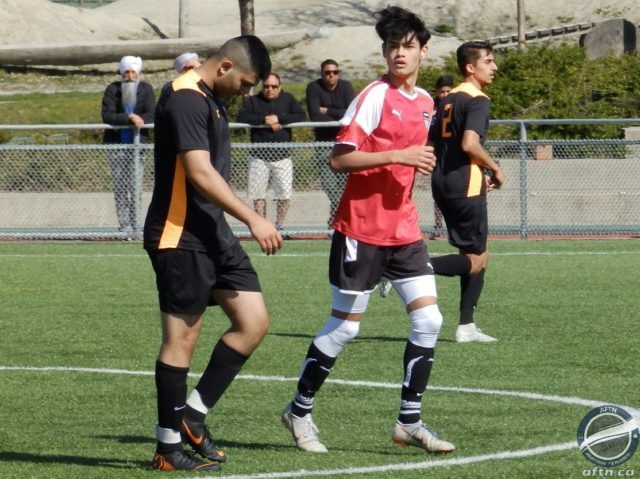 The sun was shining and supporters were out in force for the Vancouver Metro Soccer League’s (VMSL) Cup Finals day at Empire Fields on Saturday. Five finals were played out over the course of the day and there was a lot of drama and twists along the way. 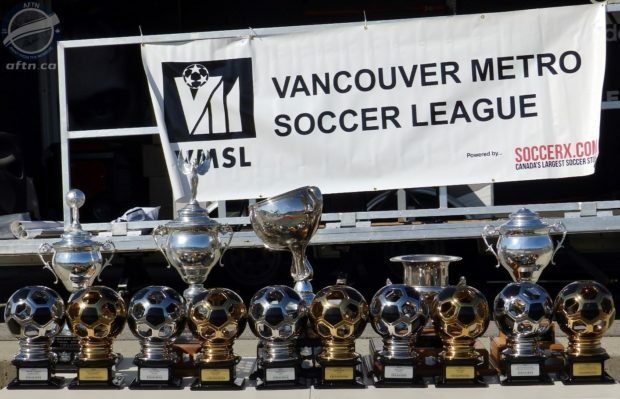 Come the end of it, West Van FC lifted the 94th Imperial Cup, Metropolitan were crowned Division 2 Cup winners, TSS FC won the Under 21 Cup in their first season in the league, and PCOV and ICSF Columbus won the Masters A and B Cups. The action kicked off early, with TSS FC and BC Tigers facing off in the Under 21 final. Both teams had finished the league campaign midtable and they played out an entertaining final in front of a large and loud crowd, led by TSS Rovers supporters group The Swanguardians. It looked like men against boys as the teams lined up, with TSS fielding players from their academy, many of whom were 2003’s and had been with their academy since they were 11. And it was the young guns who came out firing, taking the game to the Tigers from the start. TSS got the early breakthrough seven minutes in through a stunning bicycle kick from John Joseph (pictured above). It was a goal worthy of marking any final and was Joseph’s 10th goal in four cup games for the team. TSS continued to press and look the more dangerous side, but as the half went on BC Tigers started to take over, coming close on a number of occasions, including a dipping free kick that was excellently tipped over by the TSS keeper. They eventually got their equaliser deep into first half stoppage time after a scramble in the box, and it was game on. The quality of play in the second half certainly dipped, with the Tigers having the better of the few clear cut chances that were being created, but it felt that the match was destined to be heading to extra time. TSS’ Euan Aitchison had different ideas however, and got his foot onto a cross to nudge the ball past the Tigers keeper to give the young guns a 2-1 lead with around ten minutes to go. Although Tigers had a couple of great chances to send the game to extra time, it was a lead they weren’t to give up and TSS held on to lift the trophy in their first season in the VMSL. Considering the age of their squad, and some of the massive height and weight mismatches, this was a tremendous achievement for the lads and bodes well for TSS Rovers’ future too, with a few of the team expected to make their USL League Two roster for the season to come. Here’s our highlights video from the match. You don’t want to miss that first goal! The Division 2 Cup final maybe didn’t have the goals or much quality for the most part, but it wasn’t short of drama. Metropolitan FC and NK Hrvat both had their chances, with Metropolitan the better side. But they missed a penalty and eventually finished the 90 minutes with nine men. Hrvat could take advantage and the scoreless game headed to extra time. But with neither side able to find a way past either keeper in 120 minutes of football, that sent the game to a penalty shootout, and after some goalkeeping heroics from Derek Monkman, Metropolitan eventually triumphed 3-2. Next up were the two Masters Cups. PCOV beat West Van FC 1-0 in the Masters A Cup, while the Masters B Cup saw ICSF Columbus beat Coquitlam Metro Ford Shooters 3-1. That just left the showcase game of the afternoon, the 94th Imperial Cup final between West Van FC and BCT Rovers Tigers United. Both teams were evenly matches and had mixed Premier Division campaigns this season, finishing 4th and 6th respectively. That set up what many expected to be a close affair, and for the most part, that’s what we got. Ryan Dhillon put Rovers Tigers up in the 19th minute, with a nice strike across goal that nestled in the far corner. Last year’s Premier champs had won the treble last year, but the Imperial Cup was the one piece of silverware that eluded them. They’d come out strong in this one and looked like they’d now go on and dominate the final after that early goal, but West Van came roaring back and tied things up in the 33rd minute when Alan McIndoe slotted home. Seven minutes later and the Amblesiders went ahead when Shane Howard headed home. West Van continued their goalscoring blitz as the second half got underway, with Howard rifling a beautiful free kick into the top corner five minutes after the restart. It was uphill going for Rovers Tigers after that, and although they had a chance to reduce the deficit when they won a penalty, Jason Gill blasted over and that was to be that for the Surrey side, leaving West Van to lift their first Imperial Cup since their 2015 triumph with a 3-1 victory.